Michelle's son attends Wyong Public School and she responded when Principal Graham Holmes asked parents to give 10 hours of volunteering time per year, to support the school and their children's learning. 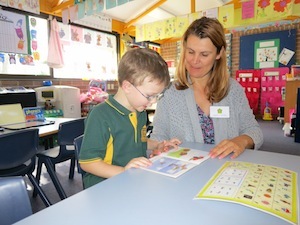 "I help out with literacy and numeracy. I change the home readers over and glue in the student homework sheets. I also help in the canteen for half an hour a week. Small things really, but it's very rewarding to see that I am helping, I am making a difference." "It's not about giving a lot of your time; it's more about giving people a little bit. When the school signed up as a Timebanking organisation, I registered as a Timebank user." In return for her volunteering, Michelle has already received support from another Timebanking group - "I have been able to use the time that I volunteer at school to get some weeding done at home and this has given me more time with my family." Download Michelle's case study here (pdf 467 KB).